And this morning, we are remembering a colleague and a dear friend, Carl Kasell. He died yesterday at the age of 84 from complications related to Alzheimer's. Carl was a newscaster here on MORNING EDITION for decades. And then later in his career, he became the judge and official scorekeeper for Wait Wait...Don't Tell Me! For years, the only prize the show gave out was his voice on your answering machine. CARL KASELL, BYLINE: You're trying to reach Colleen (ph). You've reached Scott's (ph) voicemail. They're probably off competing on some NPR game show right now. All things considered, I'm sure he'll get right back to you soon. Wait, wait, don't tell me who's calling until you hear the beep. KING: Peter Sagal is the host of Wait Wait and a close friend of Carl's. He has this appreciation. SAGAL: ...He began a second career. KASELL: From outside the newsroom - from way outside the newsroom, it's Wait Wait...Don't Tell Me! SAGAL: We needed him on this show because if Carl Kasell was involved, it was serious. It was important. But as soon as he had the chance, Carl dropped that serious newsman persona because what he really was and really wanted to be was funny. KASELL: I live alone with my cat called Pebbles. KASELL: I've never been married, never been kissed. Oh, shame. SAGAL: Carl Kasell was born and raised in North Carolina and can turn on that southern charm at will, with time for everyone and never a sharp word to anyone ever - not once in the 16 years I knew him. He was kind down to his bones. He was a devoted and loving husband to his first wife Clara Kasell who passed away right before I met him. A few years later, he met Mary Ann Foster who loved adventure and travel just as much as he did, which he knew because they met in front of the monkey cage at the London Zoo. As a wedding present to themselves, Mary Ann bought them matching kayaks which they used to go up and down rivers in Virginia when they weren't traveling the world. And wherever he went, Carl told me with some delight, people would recognize him. And upon request, he'd say their name. But of all the reasons I loved him, the most important was how much Carl enjoyed himself. He was a born broadcaster who loved his audience just as much as they loved him. KASELL: He never shied away from a joke when there was one to be made. Here's the very last time he appeared on NPR - the last episode of Wait Wait...Don't Tell Me! he presided over as judge and scorekeeper in 2014. SAGAL: We wanted to send Carl out the way he wants by simply doing a good radio show. KASELL: Why start now, Peter? SAGAL: Carl retired then, but the people who had grown up with his voice on MORNING EDITION and on Wait Wait never forgot it. His fans were everywhere - from truck drivers, who heard his first morning newscast at 5 a.m., to the president of the United States. BARACK OBAMA: Over the years, Wait Wait...Don't Tell Me! has become an institution in my hometown of Chicago and across the country. And Carl, you've been its heart and soul. I will never forget my time on the show. A lot of people didn't know my name, but you guys were already making fun of it. SAGAL: Just two years ago, Carl and Mary Ann came to see us do our show at Wolf Trap in Virginia. And I was able to give the crowd there a thrill. SAGAL: But I do want to introduce one more person to you. We're here in Washington, D.C. So we're joined by an old friend of ours and a dear friend and somebody who remains - 18 years after this show began - the heart and soul of our show and certainly the center of our hearts. Ladies and gentlemen, Mr. Carl Kasell is here. Carl Kasell was grateful for every day he was able to speak to you. And we were grateful for every day we got to spend with him. 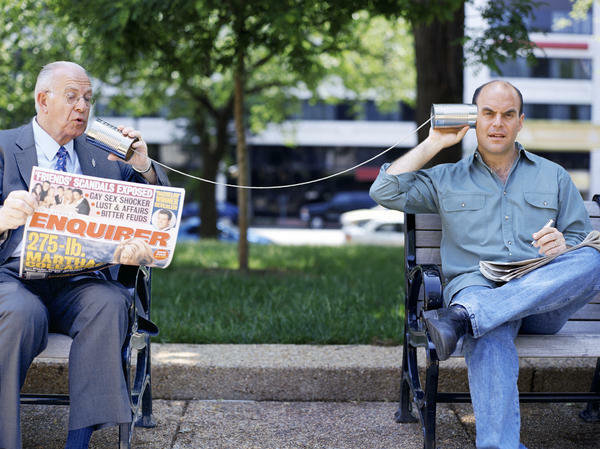 For NPR News, this is Peter Sagal. Transcript provided by NPR, Copyright NPR.